2 Hour Fire Smoke Vinyl Sign. 11"x 15"
Be located within 15 feet (4572 mm) of the end of each wall and at intervals not exceeding 30 feet (9144 mm) measured horizontally along the wall or partition. 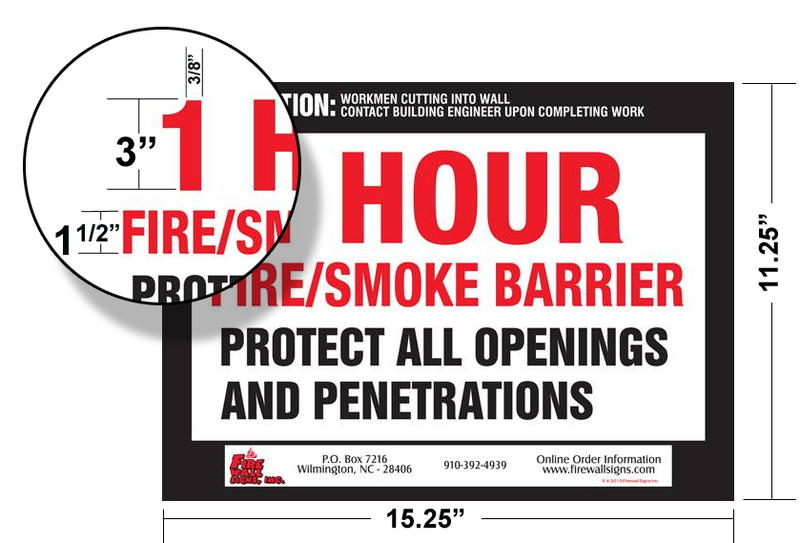 Include lettering not less than 3 inches (76mm) in height with a minimum 3/8" (9.5mm) stroke in a contrasting color incorporating the suggested wording “FIRE AND/OR SMOKE BARRIER—PROTECT ALL OPENINGS” or other wording. or other wording. As you will see from the display, All of our signs are in full compliance with Section 703.7 of the 2015 International Building Code. *Expected code update will be in 2018. What size are the letters?